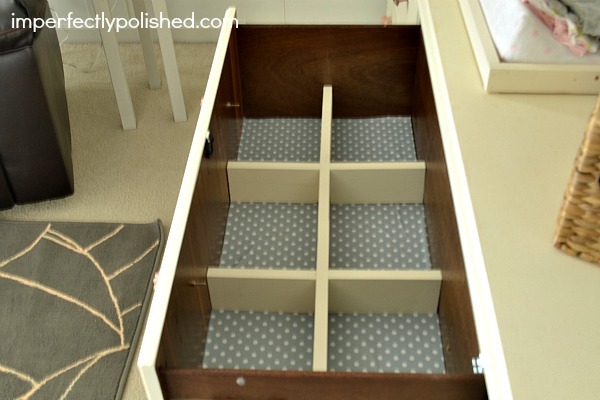 I shared last week how I made a quick update to Baby H.’s closet doors with some wallpaper from Chasing Paper. This removable wallpaper is awesome. It’s so easy to use because it’s basically like a giant sticker. You just cut it to the size you want and peel off the back and stick it to whatever you want. 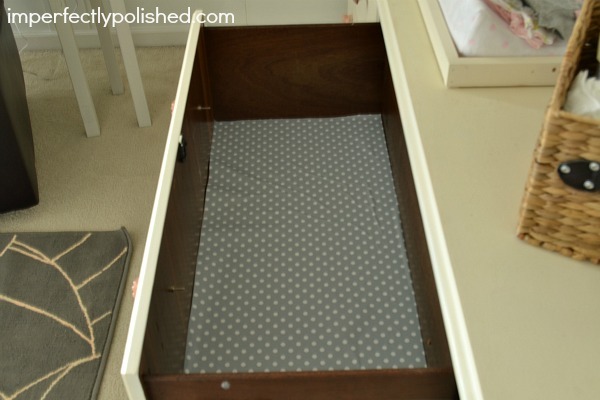 I decided to spruce up the inside of the dresser drawers with the gray polka dot paper to soften all the dark wood in there. I started by emptying out all the clothes and separators that were in there. Then I measured the drawer and cut some paper to size. Before peeling off the back I laid it in there to make sure it would fit well. 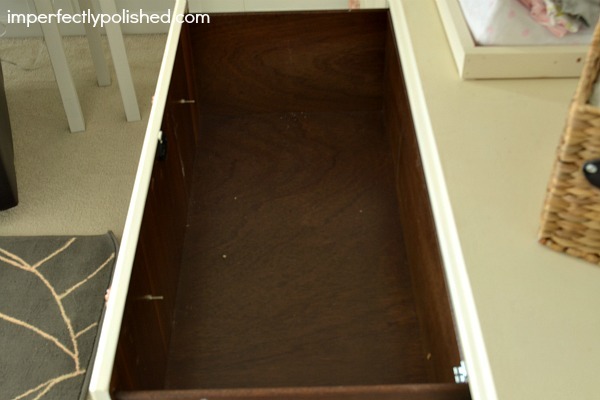 Once I had it all nice and snug, I peeled off the back, stuck it to the bottom of the drawer, and put the separators back in. And put all of her sweet clothes back in their spots. I love how the polka dots stand out by her tiny little outfits. If you haven’t gone over to Chasing Paper yet, go now! 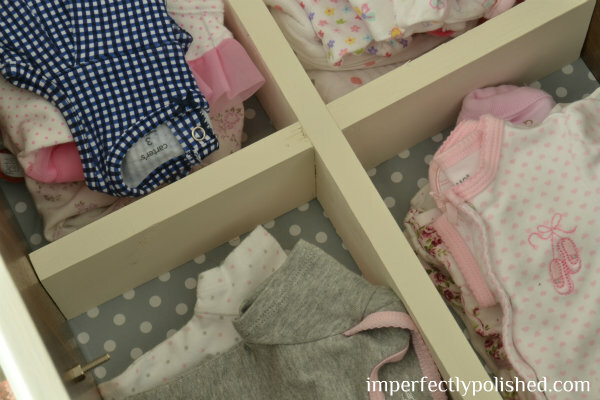 They have tons of amazing prints and there are literally hundreds of ways you can use it. If you want more ideas on how to use the wallpaper in your home, Elizabeth shares some great projects on their site too! 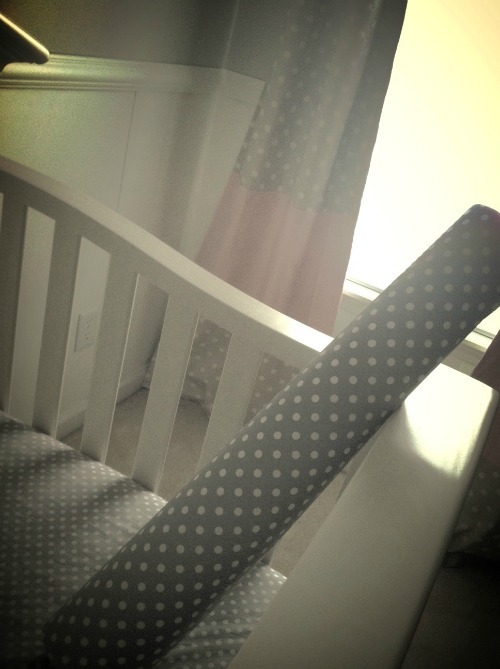 Luv all the the little details you have done to the nursery… It’s honestly one of the sweetest..